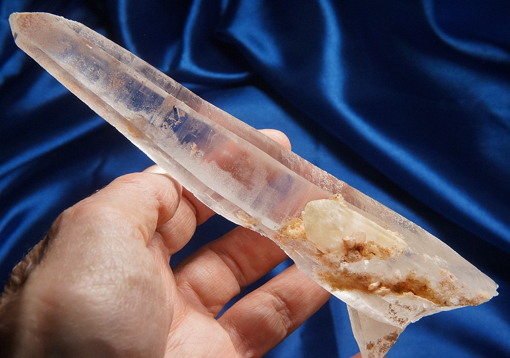 This is an awesome and long, Lemurian quartz laser wand from Brazil, 5.8 oz and 5.3" by 1.7" by 1.2" with several students at her healed base. She is included with both chlorite in warm peaches and gold shades and there are several areas on her side and spotty areas around her base where the chlorite has caused erosion, now healed … including a bit at her laser termination. The peach color is from hematite staining and it lends a lovely touch as well as splendid energies to this beauty! It’s interesting as there is a veritable landscape visible on the other side of the eroded area, as seen through the clarity of her inner self. Her sides show a variety of starbrary glyphs among finely-expressed Lemurian lines. She has a few odd very tiny dings, but it otherwise in excellent condition and one of the most sweet and unusual wands you’ll ever meet! Normally chlorite has a role that is both clarifying and protective. This Spirit is indeed both, but in a different sort of way – the clarity that comes is that of ‘clearing away the cobwebs’, allowing you to ‘see’ and sense more easily. Understanding is possible on a whole new level. She is a wonderful scrying crystal, enhancing vision and interpretation of what is ‘seen’. It is rare when a crystal presents these capabilities to a special Keeper. Such crystals were used in both Lemuria and Atlantis and were favored for the determination of future direction for the civilization.